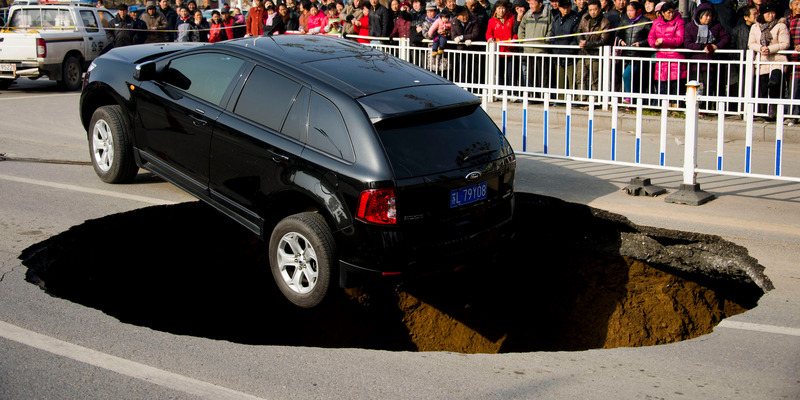 VCG/Getty ImagesA Ford Edge crossover on the verge of a sinkhole in China in 2014. 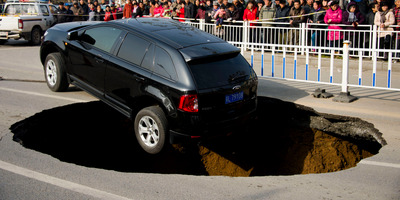 The drop is attributed to a confluence of factors, from Ford’s makeover of the company to the Chinese economic slowdown. Ford has been dealing with a series of maladies from President Donald Trump’s various tariffs. Ford’s sales in China nosedived in September as a slew of factors, including President Donald Trump’s trade war and a slowdown in the Chinese economy, slammed the company. China’s economy has slowed in recent months, with the International Monetary Fund marking down gross-domestic-product growth projections for the country and investment in infrastructure and businesses also slowing. Ford has warned the increased costs could depress sales, and the trade uncertainty contributed to the company’s profit forecast cut in July. The collapse in Chinese sales isn’t the only trade-related problem for Ford. CEO Jim Hackett revealed that Trump’s decision to impose tariffs on steel and aluminium coming into the US would cost the company $US1 billion in 2018 and 2019.